Is Lithium The New Gold Rush? Combating climate change will require action, ingenuity, leadership and technological solutions from all corners of the globe to prevent the worst of its effects. Energy generation and transportation, two of the largest sources of greenhouse gas pollution, provides our society with the lifestyle we demand. One of the key technology innovations providing a potential solution for our future energy requirement is the lithium-ion battery. Just take a look around you – a lithium-ion battery cell powers your smartphone, tablet, and laptop. The cordless drill and LED torch in your workshop are now powered by a lithium-ion battery pack. Your neighbor down the road driving a Nissan Leaf or Tesla electric car is powered by lithium-ion, and appetite for lithium-based home energy storage is growing rapidly. The volume of lithium-ion required to meet our existing appetite for lithium-based batteries is already massive, let alone the predicted future volume. What is truly remarkable is the predicted surge and rapid growth in the demand for this battery technology and consequently the associated raw minerals. 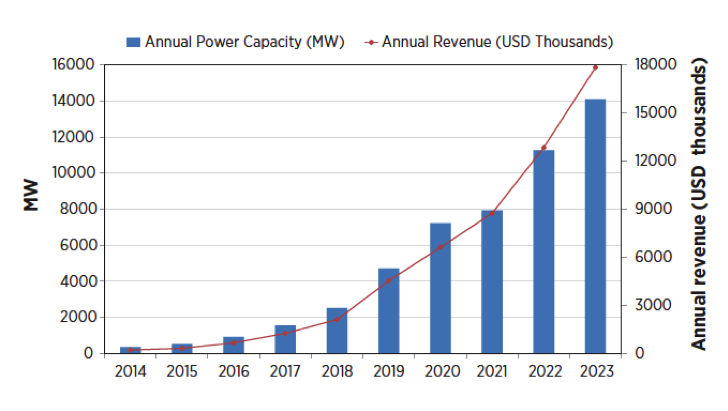 Worldwide forecast of battery storage capacity and revenue for utility scale applications. So where does all this lithium come from? And why is it so good for energy storage? Lithium-ion is not unique in its’ ability to store energy, however it does have several advantages over the alternatives. Lithium-ion batteries have a high energy density (capacity in relation to volume) as well as power density (rate of charging/discharging). This allows lithium-ion to take up minimum physical space and reduced weight while providing high energy and power. They can achieve a high number of discharge cycles (when used correctly) and can tolerate deep discharge without greatly compromising longevity. 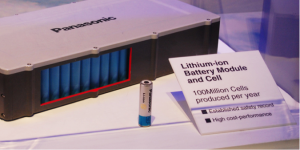 Lithium-ion batteries come in many shapes, sizes and chemistries. Each variation has its own unique set of advantages to suit certain applications, however the key ingredient (and what makes it a ‘lithium-ion’ battery) is the lithium carbonate compound. The lithium compound itself is a light, soft, solid metal, with a silvery-white texture, and has the highest electrochemical potential of any metal. Lithium compound is highly reactive to water and oxygen, and is highly flammable. For this reason it is typically stored in mineral oil, and lithium safety is a high priority. In a battery, the lithium is combined with other compounds such as cobalt, manganese, phosphate, nickel, aluminum, or titanate to produce specific chemistries that balance performance characteristics desired by each application. The lithium component is often only very small proportion of a battery, usually around 3%, but without it the battery would not function. To achieve larger storage capacities, manufacturers simply connect multiple individual cells together to create one large ‘battery module’. For example, the Tesla Model S has around 7000, 4cm high cylindrical battery cells connected together in its battery module. A battery pack used in Tesla Model S which uses the cylindrical 18650 cell. How & Where Is Lithium Sourced? Lithium carbonate mining has historically been produced from two sources, brines (which occur in salt flats) and hard rock mining. Lithium is the third most frequently occurring metal, but concentrations are generally too low and difficult to be viably mined. Recently, hard rock mining has fallen out of favour due to its high energy and cost intensity, encouraging a transition to brine mining. The most common brine deposits are found on continental saline desert basins. The salt-rich brines are pumped from beneath the crust of the salt lake, this slush is then filtered into a series of large, shallow ponds. Over a period of 18-24 months the lithium brine slowly evaporates to a concentration of around 6% lithium. The result is a yellowy liquid resembling thick olive oil ready to be shipped to nearby processing plants. The lithium is separated out with soda ash and lime, and then turned into a fine powder – ready for transportation to the battery manufacturing plant. 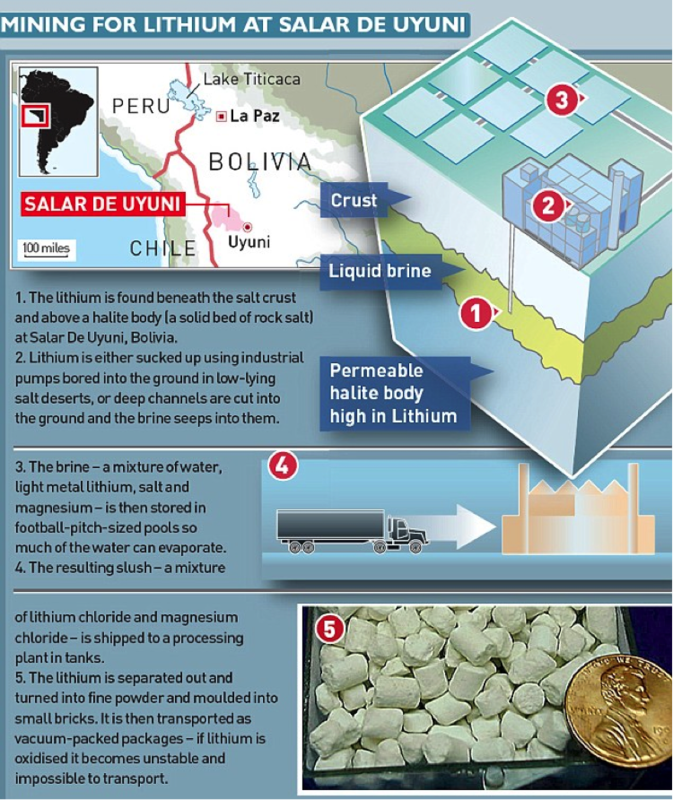 The Salar De Uyuni in Bolivia has the largest known lithium reserves in the world, and is currently supplying around half of the lithium used globally. “Like any mining process, it is invasive, it scars the landscape, it destroys the water table and it pollutes the earth and local wells. 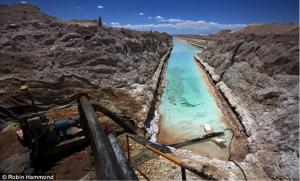 This isn’t a green solution.” Says Guillen Mo Gonzalez from a Chilean delegation to Salar De Uyuni, warning of the problems of lithium mining. 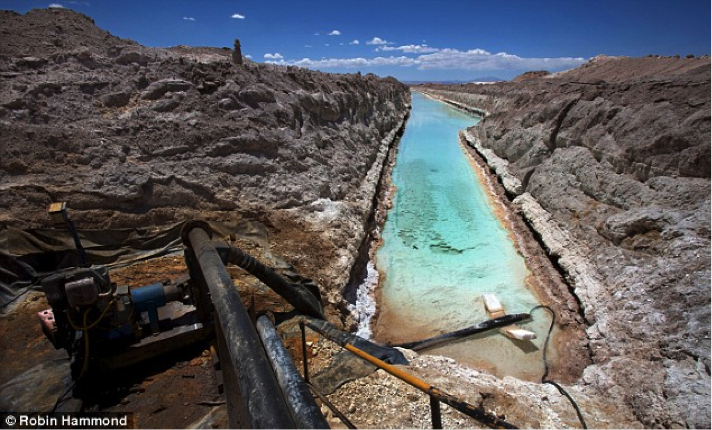 Polluted water, blue with chlorine at a lithium mine in the Atacama desert, Chile. The cost of recovering lithium through recycling is as much as five times the cost of lithium produced from brine salt lakes, lack of standardization in chemistries, and low value of other metals in batteries all combine to make lithium battery recycling economically unviable. The good news is that lithium battery cells can be 99% of the battery can be recycled, almost indefinitely. Lithium battery recycling is in its infancy, and demonstration projects are currently underway in Europe, the USA and Japan to develop effective and feasible recycling technologies with a complete ‘closed-loop’ approach.